Otome Hasaki is a 15-year-old girl. Minami Hasaki is a 15-year-old boy. They have the hots for each other. Wait, there’s more. They’re step-siblings. That’s the premise of Cherry Juice, the shojo manga (girls’ comics) from Haruka Fukushima, the creator of Kedamono Damono and Instant Teen. It’s been five years since Otome, the elder by three days, and Minami became siblings, and they’ve spent much of that time fighting. They’re in their last year of junior high school and are planning for their admission into high school. Minami has been ignoring the fact that Otome has become a beautiful teen girl, but his friend, Amane, hasn’t. Perhaps, Otome also hasn’t been noticing Minami, but a female classmate named Kasumi has. Otome and Minami pretend that they’re not jealous, but then, why do they care so much? 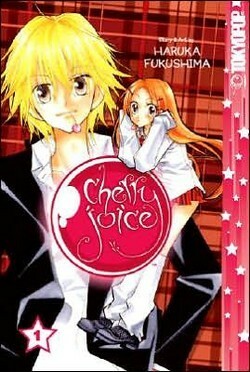 THE LOWDOWN: TOKYOPOP’s description of Cherry Juice, Vol. 1 as a romance/drama is dead on. While Fukushima’s story of love quadrangles is overwrought, her beautiful art – a catalog of bishounen (beautiful boys), not to mention the female characters that provide light fan service – is a muscular performance of atmospheric teen romance. Costumes and custom hairstyling are extra. POSSIBLE AUDIENCE: Cherry Juice’s girlishness would normally limit its audience to girls, but Fukushima’s pretty-x-3 art is not to be missed. Read a review of Haruka Fukushima's Kedamono Damono. Shop TOKYOPOP at the Amazon aStore.